Just How Intense Is Ram Truck’s Winter Testing? The world is full of warm places, but some of us (read: all of us here at The News Wheel) have chosen to live in places where the temperature decides to hang out at -10˚F because we are just gluttons for punishment. Those of us in these frigid, snowy hells still need to get work done, however, and it’s important that our half-ton and larger pickups operate perfectly in extreme conditions. Ram Truck’s winter testing on its lineup ensures that this is possible. The testing is performed in some of the coldest places in the country, including Houghton, Michigan, and Bemidji, Minnesota, to make sure all Ram pickups are suited to the harsh climates of Canada and the northern United States. Among Ram Truck’s winter testing, affectionately called “The Cold Trip,” are a slush test, a snow ingestion test, and a plowing test. When Irving Berlin dreams of a white Christmas, he likely doesn’t consider the aftereffects: roads, sidewalks, and yards pockmarked with horrid gray-white slush that are not only visually unappealing, but also can pose a real threat in severe temperatures. Suppose the roadways are lined with slush during the day, and your Ram 1500 barrels through it as you run your errands. You come home for the day and park outside while the slush slithers into every nook and cranny of your truck. Then, at night, the temperature drops dramatically, and important vehicle components, like fuel lines and brakes, are encased in ice. How can you be sure that your truck will operate correctly? That’s where Ram Engineering comes in. During the slush test, the engineers subject the pickups to a course of 12-inch deep slush, then park them overnight in a refrigeration facility, which is kept at -20˚F. The test proves that Ram’s trucks specifically are built to survive freezing in sub-zero temperatures and operate just fine in the morning. Ram calls this one the “Arctic Blast,” and with good reason. The simulation mimics the low temperature, high wind, heavy snow conditions we northerners are accustomed to. During the test, a convoy of trucks drives one after the other for multiple hours, switching positions now and again. The truck in front, of course, creates a drag that throws ice and snow at the vehicles behind it. The test is meant to demonstrate how Ram’s products operate during snow ingestion. (Ram does a similar test in Arizona deserts to demonstrate the same with sand). The test shows that Ram has strategically placed its powertrain innards so that they cannot be damaged through such ingestion. When road conditions are poor, cities rely on ¾-ton or larger trucks to clear the way. To ensure that its trucks are capable of carrying out their obligations, engineers plow more than 10,000 tons of snow during testing to measure the trucks’ performance and effectiveness. 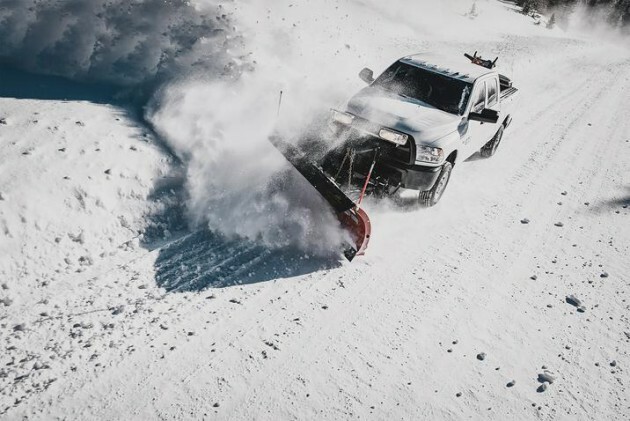 The Ram 2500 and 3500 even come with a Snow Chief Package for optimal plowing.